Live transmission is available as a replay during the day. Stephanie Roble/Magaret Shea USA win Bronze in the 49ersFX with a 2nd Medal Race rank. Ravi Parent/Caroline Atwood USA, 7th yesterday, conclude the Worldcup event on rank 9 overall. Finishing 6th in the last qualification race yesterday, Stuart McNay/David Hughes USA advanced on the 9th place overall and qualified for the Medal Race today Sunday. --- Please find hereafter the overview on all events: David and Lachy Gilmour AUS finished 4th in the 49er Medal Race and defended their first place ahead of McHardie/McKenzie NZL and Burling/Tuke NZL. With a victory in the 49erFX Medal Race, Odile Van Aanholt/Marieke Jongens NED consolidated their top position in front of Omari/Distefano ITA and Roble/Shea USA. In the Nacra-17 , Iker Martinez/Olga Maslivets ESP advanced on rank 1 overall with a 2nd race rank, one point ahead of the previous leaders Ben Saxton/Nicola Boniface GBR. The Olympic Champions Santiago Lange/Cecilia Carranza ARG moved up on rank 3. Ravi Parent/Caroline Atwood USA are on rank 9. --- All other classes sailed their last fleetraces. --- In the 470men , Zu/Wang CHN will start to today's Medal Race with 3 point lead on Snow-Hansen/Willcox NZL. 10 points behind, Wagen/Siegwart SUI still have an option on the victory. --- Fernanda Oliveira/Ana-Luiza Barbachan BRA are the premature winners in the 470 women with a 28 point advantage on Di Salle/Dubbini ITA closely followed by Berta/Caruso ITA. --- In the Finns , Alex Muscat ESP defended the first position and will have to fight for victory with Jorge Zarif BRA only two points back. Joan Cardona ESP on 3rd is already 18 points behind. --- In the Lasers Standard , Pavlos Kontides CYP will start to the Medal Race with a 6 point lead on Jonatan Vadnai HUN. Another 5 points back follows Hermann Tomasgaard NOR on 3rd. Yanic Gentry MEX 33rd, Robert Davis CAN 49th and Marek Zaleski USA 69th are the best North Americans in the final rankings. --- Two races were sailed in the Lasers Radial and Dongshuang Zang CHN has now a 4 point advantage on Vasileia Karachaliou GRE. Anne-Marie Rindom DEN is 7 points behind, still with an option on the overall victory today. Isabella Bertold CAN on 12th missed the Medal Race. Hanne Weaver on 65th is the best USA sailor. --- The winds yesterday were once more filling in late and remained very light. Numerous favorites missed the Medal Races in these wind conditions. --- All ranking lists and the daily news. --- You can follow the Medal Races this Sunday livestream on our sailing-news.com website beginning at 9h am UTC. Yesterday, Sorcha of Peter Harrison GBR concluded the 2019 Voiles de St-Barths as first overall in the Maxi-1 division having won all 5 races ahead of SHK Scallywag of David Witt HKG. In the smaller Maxi-2, Windfall' of Michael Cotter IRL finished on top. The CSA-1 winner is Kuka3 of Franco Niggeler SUI. --- Here the final results of all 9 divisions, the photos of day 5 and the event website. Mariella of Carlo Falcone, a 1938 79-foot Alfred Mylne Yawl, took the line honours for the Common Course in an elapsed time of 2hrs 30min ahead of Seefalke II of Oliver Greensmith, a 1936 41-foot Rasmussen Sloop and Peter von Seestermuehe of Christoph von Reibnitz, a 1936 59-foot Henry Gruber Yawl. Vibrant sailing conditions on the beautiful southern coast of Antigua prevailed again on the 2nd race day of the Antigua Classic Yacht Regatta on the Butterfly Courses, i.e. the Common Course at 20nm, and the Long Course at 30nm, with warm SE trade winds of up to 20kn. The report of day 2 with all details, all results and the event website. Yesterday, the 'windiest' - however shifty and puffy - conditions prevailed in Genoa with 6-9kn allowing all classes to race. The 49ers, 49ersFX and Nacras 17 concluded their qualification series, the other classes will have their last fleetraces today Saturday. --- In the 49ers, David and Lachy Gilmour AUS have taken the lead 6 points over the Olympic Champions Burling/Tuke NZL. Peters/Sterritt GBR, McHardie/McKenzie NZL and Lange/Lange ARG on the ranks 3-5 remain in the race for the title and medals. Judge Ryan/Hans Henken USA are on the 33rd place. --- In the 49ersFX, Carlotta Omari/Matilda Distefano ITA are new on first 4 points ahead of Baad-Nielsen/Thusgaard DEN, the former leaders Van Aanholt/Jongens NED are 3rd 8 points behind. Stephanie Roble/Magaret Shea USA on the excellent 5th place are qualified for the Medal Race. --- In the Nacras 17, Ben Saxton/Nicola Boniface GBR have a 6 point lead on Iker Martinez/Olga Maslivets ESP before the Medal Race. Zajac/Matz AUT 10 points back have still a chance for victory today. Ravi Parent/Caroline Atwood USA on rank 8 qualified for the Medal Race as well. We livestream these final races today Saturday morning beginning at 9h a.m UTC on sailing-news.com. --- The 470s completed 3 races yesterday and Fock/Dackhammar SWE moved on top of the 470 men fleet 2 points ahead of Doi/Kimura JPN. Wagen/Siegwart SUI advanced on rank 3 with a 5 point backlog. Stuart McNay/David Hughes USA are 17th. --- In the 470 women, Oliveira/Barbachan BRA have taken the lead as best of the day, in front of Cohen/Lasry ISR and Di Salle/Dubbini ITA on 2nd and 3rd. 17th are Atlantic Nora Brugman Cabot USA. The fight for the Medal Race qualification will be tight today, as the ranks 9-18 are separated by 6 points only ! --- Alex Muscat ESP has taken the lead in the Finns, followed by Jorge Zarif BRA and Oscari Muhonen ESP closely behind. No North Americans sailing. --- The Lasers succeeded to complete three races yesterday. With a solid row of top ranks, the World Champion Pavlos Kontides CYP moved on first in the Lasers Standard ahead of Jonatan Vadnai HUN 4 points behind on rank 2. Hermann Tomasgaard NOR is now on 3rd. The best North Americans are Yanic Gentry MEX on 48th, Robert Davis CANon 49th and Marek Zaleski USA on 61st. --- A trio at equal points is on top of the Lasers Radial: Dongshuang Zhang CHN, Vasileia Karachaliou GRE and Anne-Marie Rindom DEN. The best NorAms are Isabella Bertold CAN on 6th and Hanne Weaver USA on 55th. --- Today, three more races are on the program with the fleets split in Gold and Silver. --- Tomorrow Sunday, the Lasers, 470s and Finns will hold their Medal Races, that can be followed livestream on our sailing-new.com website. --- All ranking lists and the news. Winning the two races of their groups, Richard Schultheis MLT and Marco Gradoni ITA share the overall lead in the huge Optimist Juniores fleet, one point ahead of Caspar Ilgenstein GER with two race wins as well. The best North Americans are Jake Homberger (Lauderdale YC) USA on rank 59, Alejandro Beckmann Riquelme (CN El Balis) MEX on rank 109 and Claire Ramsey (RNSYS) CAN on 181 among the 991 participants. The results. --- In the younger Cadetti, Erik Scheidt BRA remains on top in front of Sofia Bommartini ITA and Amelie Röpke GER at equal points on the ranks 2 and 3. Christopher Gage (Alamitos Bay Yacht Club) on rank 29 is the best USA sailor among the 91 participants. --- The event website with all ranking lists and the event facebook page. 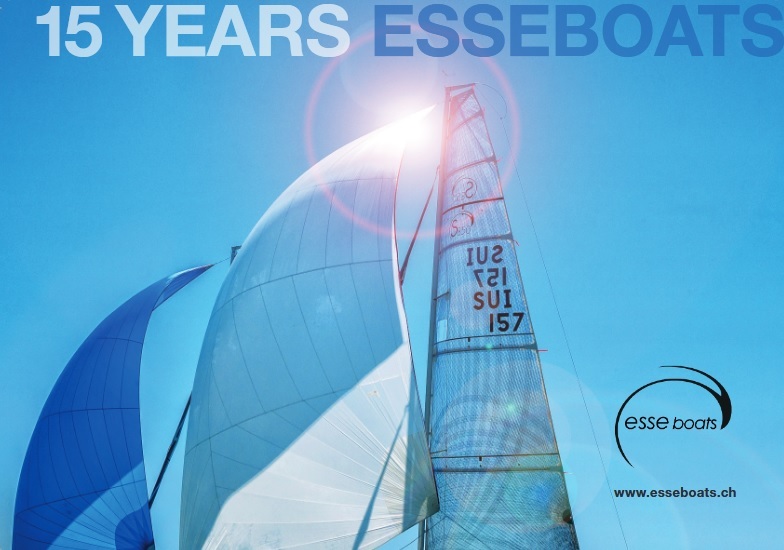 Good sailing conditions with a fresh Eastwind prevailed yesterday in Cannes for the first event of the 5o5 Europacup 2019 . Leading after three races are Quirk/Needham AUS one point ahead of Hamlin/Nelson USA. On rank 3 another point behind follow Pinnel/Russ GBR. --- The ranking list and the event website. The 32nd edition of Antigua Classic Yacht Regatta is underway with over 40 boats in 10 classes sailing ! A Common Course of 21nm, and a Long Course of 31nm along south coast of Antigua provided thrilling racing in a solid easterly breeze, topping out at close to 20kn. Athos posted the shortest elapsed time for the entire fleet of 2 hours 13 minutes and 43 seconds, and took the win in the Tall Ships Class, after time correction, ahead of the Klaus Röder 157-foot Ketches Chronos on 2nd and Rhea on 3rd. With an overall length of 203 foor, Athos is the world's largest privately-owned two-masted schooner, carrying a 33'000 sq ft sail plan on her 200 foot rig. --- The report with all details and photos on day one, all results and the event website. Yesterday, the wind at the Wordcup Series in Genoa was again light (5-7kn), but for the first time sufficient for seven of the eight classes present to complete at least one race. --- In the 470 men, Kampelmühler/Czajka AUT won the only race ahead of Ichino/Hasegawa JPN and Mantis/Kagialis GRE. McNay/Hughes USA are on the 8th place. --- In the 470 women, Cohen/Lasry ISR ahead of Oliveira/Barbachan BRA and Seabright/Carpenter GBR are the first leaders. Brugman/Brugman USA follow as 9th among the 35 teams. --- Three races were held in the Finns with Oscari Muhonen FIN twice on top and clearly leading overall ahead of Jorge Zarif BRA and Alex Muscat ESP. To be noted, that the Finn elite, including the USA and CAN teams, refrained from participating. --- The Lasers Standard completed their third race and Tonci Stipanovic CRO has taken the overall lead ahead of Duko Bos CRO and Finn Lynch IRL. Marek Zaleski USA 46th, Robert Davis CAN 62nd and Yanic Gentry MEX 67th are the best of their nations among the 112 participants. --- The Lasers Radial did not sail, and after the only race finished so far, Line Flem-Höst NOR and Maud Jayet SUI share the lead. Isabella Bertold CAN is on 5th and Hanne Weaver USA on 63rd. --- The speed classes will complete the Qualification Series today to select the 10 best for tomorrow s Medal Races. In the 49ers, Sime Fantela/Mihovil Fantela CRO are on first after 5 races, followed by Botin/Lopez ESP and Gilmour/Gilmour AUS. The Olympic Champions Burling/Tuke NZL are on rank 10. Judge Ryan/Hans Henken USA are on the 32nd position. --- In the 49ersFX, Odile Van Aanholt/Marieke Jongens NED won all 3 races taking the overall lead ahead of Wester/Netzler SWE and Gross/Klinga SWE. Stephanie Roble/Magaret Shea USA are on the 6th rank. --- In the Nacras 17, all teams have completed three heats with the experienced duos on top: Saxton/Boniface GBR are first followed by Jones/Saunders NZL and Martinez/Maslivets ESP. Ravi Parent/Caroline Atwood USA are 8th, Enrique Figueroa/Gretchen Ortiz PUR 15th. --- All ranking lists and the news. Finishing 1 and 2 in their groups, Yanne Broers NED, Alex Demurtas ITA and Richard Schultheiss MLT have jointly taken the lead in the Lake Garda Optimist Meeting. The World Champion Marco Gradoni ITA follows on rank 5. Owen Grainger (CRYC/AYC) on rank 80 is the best of the 40-boat USA delegation. Alejandro Beckmann Riquelme MEX is on rank 114. Claire Ramsey CAN is 139th among the 900 participants. --- In the younger Cadetti, Erik Scheidt BRA (son of the 5-times Olympic medalist Robert Scheidt BRA) and Amelie Röpke GER are on the first place with a race win each. Christopher Gage (Alamitos Bay Yacht Club) on rank 13 is the best USA sailor among the 91 participants. --- A good 12-14kn breeze prevailed yesterday during the first two races of this traditional Easter event. The ranking lists and the event website. The Single-Handed Race on the eve of the Antigua Classic Yacht Regatta was held yesterday with 11 beautiful classic yachts in a one-hour race along the south coast of Antigua. with moderate trade wind conditions of 14-16 knots, and a relatively smooth sea state. Skippers raced solo without the use of auto-pilot, but were allowed an observer on board, who could not participate in sailing. --- The Dykstra 44 Willpower of Don Ward took line honours in the Spirit of Tradition Class but after time correction was third. Tanner Jones racing the 1963 Jack Holt 28-foot sloop Rita was second, and the winner was the 1989 Six Metre Biwi Magic , sailed by Tony Sayer. --- The Single-Handed Race took place on the eve of Antigua Classic Yacht Regatta, starting today Friday with four days of full fleet racing. --- The news with photos and the event website. Again a day with almost no wind in Genoa yesterday, and it can hardly be understood, why the innocent World Sailing (responsible as Organising Authority) dislocated the European Worldcup event from the wind-safe Hyères FRA with its perfect infrastructure and organisation to this wind-risky Italian major city. Only the Lasers Radial and one 49er group could sail at least on race in a 3-4kn wind. --- For the Lasers Radial sailing in two groups, it was the first race of the competition. The day winners were Line Flem-Höst NOR and an Maud Jayet SUI. On the 2nd ranks of their groups followed Anne-Marie Rindom DEN and Vasileia Karachaliou GRE.Tatjana Drozdovskaya BLR and Isabella-Anna Bertold CAN finished 3rd each. --- The 49er yellow fleet managed to complete one race as well with Fantela/Fantela CRO (ranks UFD/1/1 so far) winning, but with the second fleet results missing, the overall rankings remain unchanged, as this is the case in the Nacra 17 and 49ersFX. The 470 Men and Women as well as the Finns will have to wait another day to get their competition underway. --- All ranking lists and the daily news, as well as all North American results (PDF). As a prelude to the Optimist Lake Garda Meetings, the Nations Trophy was held with one representative per country racing. After three races, the local Alexis Demurtas ITA was the winner ahead of Caspar Ilgenstein GER and Henrik Puolakka FIN. The results of the North Americans and Caribbeans: CAY 8th, BER 10th, BAH 19th, ISV 20th, MEX 21th, USA 34th. 36 nations from 5 continents were present. --- The ranking list. --- The Optimist Meeting begins today with huge fleets as usual: 991 Juniores from 35 nations and 117 Cadetti (U12) will participate. --- The event website. For yesterday’s tricky Round the Island race, local knowledge paid off for the race veterans that knew how to successfully navigate the challenges on the 24–32nm courses around St-Barth’s rocky cliffs in a 12–15kn northeasterly with 30° wind shifts. --- Here the results, the day 3 report, the photos and the event website. Today is lay day, racing resumes on Friday and lasts until April 20. Very light winds prevailed again on the second day of the Genoa Worldcup event and only the Lasers and the 49ersFX completed one race each in a 5kn breeze. --- Tonci Stipanovic CRO and Herrmann Tomasgaard NOR were the winners in their Laser Standard groups with Duko Bos NED and Sergey Komissarov RUS twice on rank 2. The best North Americans are on mid-fleet ranks with Robert Davis CAN 45th, Marek Zaleski USA 49th, Yanic Gentry MEX 59th. --- In the 49ersFX, only one group finished a race and the overall ranking list remains unchanged with Stephanie Roble/Magaret Shea USA on the 4th place. --- The 49ers completed two races on the opening day with Harry Melges/Finn Rowe USA on rank 28. The Nacra 17 have on race with Ravi Parent/Caroline Atwood USA on 3rd. --- All 8 classes are scheduled to sail today, but the wind forecast remains not very promising for the second half of the week. --- All ranking lists, the results of all North American participants (PDF), the official report and the video of the day. Over the past weekend, the Swan-Cup was held in Monaco with 14 Swans 42, 45 and 50 on the starting line. Only three races could be completed within 4 days, as the winds remained mostly absent. In the largest fleet, the Swan 50 with 8 participants, Leonardo Ferragamo ITA (tactics Ken Read USA) was the winner ahead of Andrea Masi ITA and Dmitry Ribolovlev RUS (with Fernando Echevarri ESP). Tied on rank 4 followed Stefan Heidenreich GER (with Jochen Schümann GER). Morten Kielland SUI (with Iker Martinez ESP) finished 5th. --- The event website with all ranking lists and the video of the final day.